Can Kit's super-weird superpower save her world? 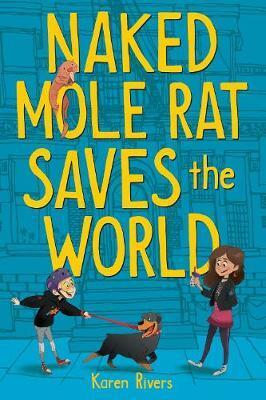 Kit-with-a-small-k is navigating middle school with a really big, really strange secret: When she's stressed, she turns into a naked mole rat. It first happened after kit watched her best friend, Clem, fall and get hurt during an acrobatic performance on TV. Since then, the transformations keep happening--whether kit wants them to or not. Kit can't tell Clem about it, because after the fall, Clem just hasn't been herself. She's sad and mad and gloomy, and keeping a secret of her own: the real reason she fell. A year after the accident, kit and Clem still haven't figured out how to deal with all the ways they have transformed--both inside and out. When their secrets come between them, the best friends get into a big fight. Somehow, kit has to save the day, but she doesn't believe she can be that kind of hero. Turning into a naked mole rat isn't really a superpower. Or is it? Karen Rivers's books have been nominated for a wide range of literary awards and have been published in multiple languages. When she's not writing, reading, or visiting schools, she can usu-ally be found hiking in the forest that flourishes behind her tiny old house in Victoria, British Columbia, where she lives with her two kids, two dogs, and two birds. Find her online at karenrivers.com and on Twitter: @karenrivers.